Ask Corey: What’s the Best Monitor for Editing Photos and Videos? Hey Corey, I’m in the market for a new monitor. What do you use in your office, and what would you recommend? That’s a great question, especially considering that the average American spends more than 10.5 hours every day looking at screens. Photo and video editors are probably logging double that, especially during deadlines! That’s a scary statistic, but it just goes to show how important it is to put some thought into what screen we use … not to mention, how important it is to get outside and away from our screens, too (but that’s another post). Back to your question. Obviously, one of the first questions you need to answer is: what will this monitor be used for? A monitor used primarily for video or photo editing will be different than one used for surfing the web and word processing; for the latter, obviously, you can get away with a much lower price point monitor. As a contemporary storytelling company, we deal with both still and video. For many years, we loved and used the Apple Cinema Display—which was the industry standard for its color, contrast, and saturation and unmatched in its signature Apple aesthetics—until it got discontinued. One gripe we and many other creatives voiced about the Apple Cinema Display, however, was its glossy screen, which was notorious for glare. When the Cinema Display was discontinued, we experimented with several other monitors, including those with matte screens, which solved issues with glare, as well as 4K monitor screens, which have become more and more necessary as our cameras shoot 4K, 6K, and 8K files. These monitors were also height adjustable, which was useful in that we often work with different video editors of different head heights in our video-edit suite. Most recently, we found ourselves searching a monitor that was finely tuned for retouching still photographs and video color grading. For high-end projects, we frequently send our files out to a Da Vinci expert with color-calibrated monitors, but as Novus grows, we’re looking to do more of that work in-house. Bottom line: we were on the hunt for excellence, where we needed to go from being 90 percent accurate to 99 percent accurate. Again, after another deep dive of research and considering price points, we decided to go with the BenQ 27-inch 4K PhotoVue Photographer Monitor (SW271). 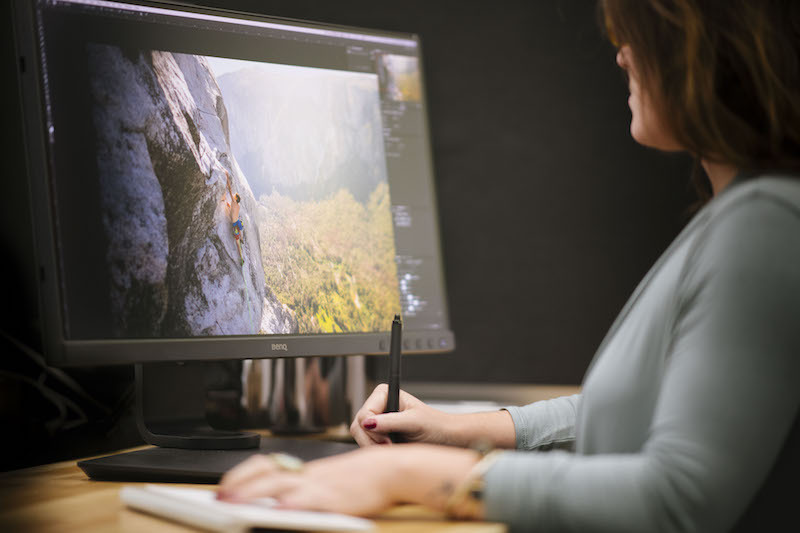 Several features of the BenQ monitor stood out to us, from its competitive price point of around $1,000 to its USB-C connectivity, to its color performance with 99% Adobe RGB and 100% sRGB accuracy. It has a matte screen as well as a shading hood that reduces screen glare even more and makes it a contender for bringing out into the field. We’ve had this monitor in the office for the past few weeks, and so far the reviews from Novus staff are two thumbs up. I can foresee us installing more BenQ monitors in our office very soon. Thanks Corey… thinking about a new monitor and wondered who I would ask.